After years of honing their craft and exploring ways of bringing together their wide range of influences, Huntly have arrived with a carefully constructed and deeply personal debut album, ‘Low Grade Buzz’. Huntly have doubled down on their “doof you can cry to” manifesto, marrying intimate songwriting with forward-thinking dance music. 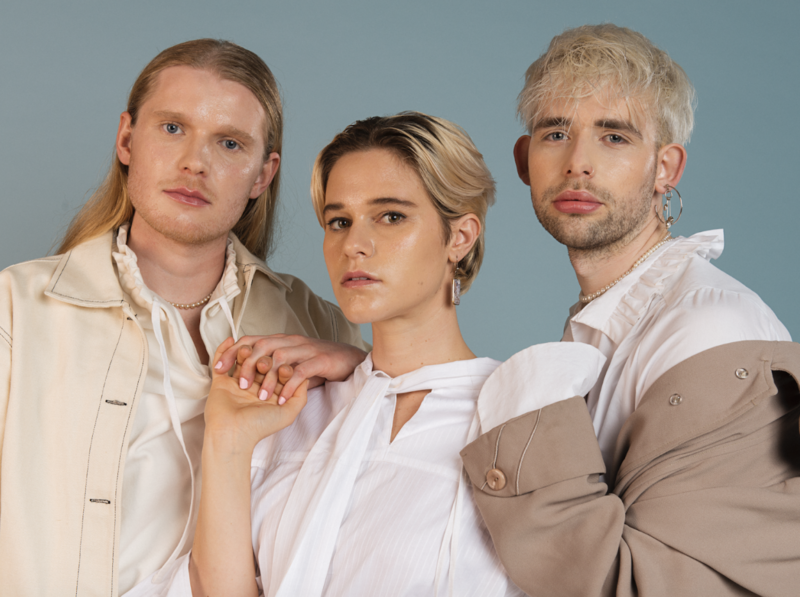 Huntly make radical pop songs which emphasise the coexistence of the personal and political, where moving and feeling are symbiotic. Working between the margins of pop, R&B, techno and drum & bass, ‘Low Grade Buzz’ is an album that crafts narratives that shift suddenly in perspective and sound whilst still full of satisfying hooks and thumping codas. ‘Low Grade Buzz’ is the logical conclusion from years of hard work; an artistic statement coalescing the angles and personas that make Huntly a unique three-piece band. Lead singer and keys player Elspeth, who moonlights in several roles across music and community-building spaces, flexes an accomplished songwriting muscle in a style that sits comfortably in the canon of cutting-edge pop. Akin to the likes of Frank Ocean, SZA and Tirzah, Elspeth writes in a way that seamlessly shifts the tonal center, putting you in a different place to where you started without ever realising it. Percussionist and producer Andy oversees most of the production on the album, which stands as an unequivocal feature across all eleven tracks, every beat feels perfectly timed. There are some truly innovative and sublime moments: the lurching and uneasy swing of the beat on ‘AUR’ acts as the perfect bedrock for Elspeth’s achingly honest narrative, snares fly chaotically around a powerful sub in the garage-inspired coda on ‘Wait (37 degrees)’, which breaks new territory for bass music coming out of Australia. Andy’s production mastery, and their capacity to connect music and narrative are evident across the entire album, but emerges especially on lead single ‘Drop Gear’. 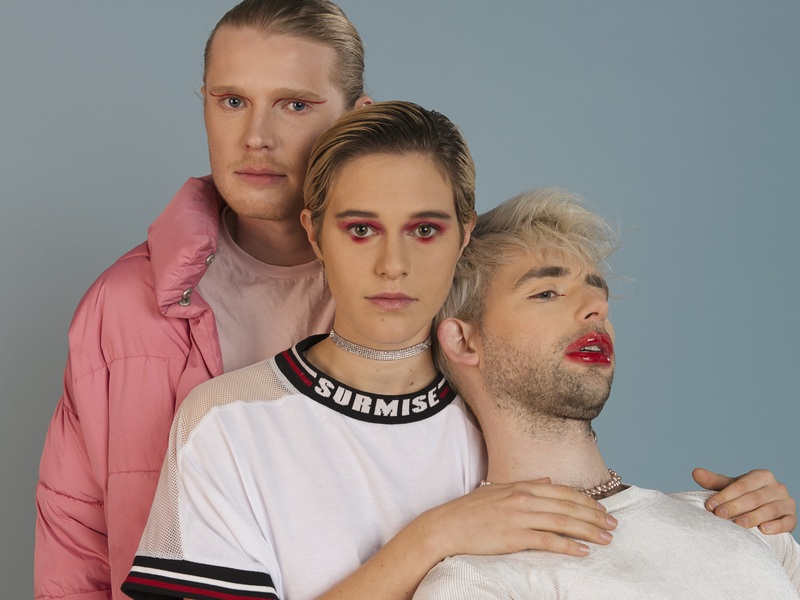 The cathartic sub drops act as a speed-racer halting suddenly and “dropping down a gear” to avoid a crash; they serve as the perfect release of tension after the emotional conviction of the track’s chorus. It’s a kind of musical onomatopoeia. Singer/Producer Charlie could be the band’s secret weapon on ‘Low Grade Buzz’, deftly switching between roles as singer, songwriter and producer. Their rough and slightly unhinged vocal delivery often working as the perfect foil to Elspeth’s ornate vocal mastery. On tracks like ‘Wiggle’ or the swampy interplanetary grooves of ‘Vitamin’, Charlie sits as Elspeth’s devil’s advocate, so the track in question becomes a dialogue; an expression of differing perspectives and styles. Charlie contributes production and synth lines throughout the album and takes the lead on tracks ‘Dusk’ and the breathtaking ‘Wait (37 degrees)’. This track registers Charlie’s innovative vision as a songwriter and producer. Commencing with nothing but piano and heavily-affected voice, Charlie’s presence in ‘Wait (37 Degrees)’ is like an incantation from some future cyborg religion. There is a violent energy in the way the track builds on the tension through the gaps and silences, as rapid-fire drum & bass breaks burst through the production. The album traverses a spectacular range of musical territory, while still managing to form a cohesive whole. From the forward-thinking emancipatory banger ‘Wiggle’, to carefully constructed pop of ‘Reckoning’, to the fierce intensity of ‘Wait (37 degrees)’, this is an album that pays homage to the conventions of pop and R&B, while also proving unbound by them. Like the title track, ‘Low Grade Buzz’ establishes something evocative, intense and unique, the work proves to celebrate the trio’s extraordinary individual strengths, while showcasing their collective craft – in a whole that is still more than the sum of their parts.